A private and secluded sanctuary awaits you in the island community of Bainbridge Island, WA. 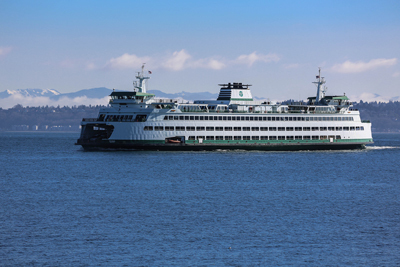 Only a 35-minute ferry ride away from Seattle, the community wows residents and visitors alike with its stunning mountain views, gently rolling hills, and small-town America feel. In 2005, the island was named by CNN/Money and Money Magazine as the secondbest place to live in the United States. It was recognized again in 2011, earning the top spot in a nationwide study of the best island enclaves by TopTenRealEstateDeals.com. With gourmet food shops, a vibrant artisan community, and an impressive selection of local wineries, it’s no surprise that Bainbridge Island continues to be a favorite hamlet for those seeking luxury real estate and a low-key island lifestyle. The charm of Bainbridge Island begins to show itself the moment you step aboard the ferry that connects it to Seattle. In fact, the commute to and from the Island is one of the biggest reasons people consistently choose the Island over mainland locations a similar distance away. For those residents, traffic and honking are things of the past, a far cry from the gently lapping waters of the Puget Sound and the sun setting on the mountains in a panoramic view. The ferry ride is different every day, allowing unparalleled enjoyment of the changing seasons and sometimes even a sighting of the elusive Orca whales. It’s almost as if time travel is achieved by getting off the ferry at the bustling dock on Bainbridge Island. Suddenly you are transported back to a time when people walked down Main Street, live music floated on the air, and the dominant aroma was roasted coffee and cinnamon muffins. 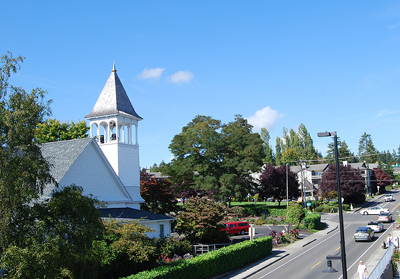 For many, the town center, affectionately called Winslow, is a storybook community. Surrounded by tall trees, pastoral fields and wooded hills, it certainly looks like a storybook community. And its rustic charms donʼt end there. They extend into the variety of eclectic storefronts, bustling coffee shops, and gourmet restaurants that keep the community connected. With only 65 square miles of land and just over 22,000 residents, Bainbridge Island could have fallen into the trap of being just another sleepy village. But its thriving artisan industries and the resulting strong economy based on small and medium sized businesses have made the town into a strong intellectual and cultural center. The variety of contemporary art available, as well as the traditional crafts that residents are so proud of, continue to draw many visitors each year. Because of the strength of its community, Bainbridge Island continues to be a haven that unites people of different strengths, from the civically-minded to the creative to the intellectual. All of these people enjoy the lifestyle that is made possible by the Island and its lack of trafﬁc, where everything you might want to do is only minutes away. It is truly a place where there is something for everyone, from the golf enthusiast to the hiker to the quiet reader. Once you experience everything that Bainbridge Island has to offer, itʼs likely you wonʼt want to go anywhere else. And yet the ability to do that, to go somewhere else quickly and easily, is one of the Islandʼs most endearing qualities. Seattle is not the only destination nearby. The Kitsap Peninsula and Hood Canal are wonderful spots for weekend travel and are accessible by bridge. Bainbridge Island unites more than just the country with the city. It unites the convenience of modern life with idyllic values from long ago: artisanship, community, and natural beauty. And that has made it more than just a place to live. It has made it a place to relax and enjoy the best that life has to offer. And that, even more than the ferry ride to get there, has made all the difference.